Many churches are involved in short-term mission trips. Most of these trips, however, are focused on economic or social development projects, coupled with ""relational evangelism."" Not many are focused on discipleship, or, more specifically, training indigenous pastors in the essential doctrines of the faith so that they can, in turn, disciple their church. In fact, reproducible models for in-depth theological education during short-term missions are rare. As a missionary presently ministering in a number of underdeveloped nations, Steve Curtis has witnessed the need for, and potential benefit of, such models. The reality is that there are countless pastors throughout the majority world who have had little to no formal training in Bible or doctrine. This book suggests a practical way that churches can use their short-term missions program--together with their adult discipleship program--to help meet this critical, global need. ""The work of Steve Curtis and Timothy Two Project International, as outlined in this book, is invaluable. It uses a biblical model rather than a pragmatic one. I heartily endorse the book and Steve Curtis unreservedly."" --Don Kistler, Founder, Northhampton Press ""This book focuses on a gap in the kinds of short-term mission trips done by church volunteers. Steve's research is thorough and documents the need for education as an activity on short-term mission trips. The model he recommends is reproducible and adaptable to many mission settings."" --Charles N. Davidson Ch, Lt. Col. USAF (Ret. ); Director, Doctorate Degree Program, School of Divinity, Liberty University ""Steve Curtis has gained years of experience to be a 'mobile missionary instructor' in the most remote places among unreached people groups in developing countries... . In this book he deals with all aspects of the training and thrusting out of church members as short-term educators in God's worldwide harvest field. My prayer is this book will be used to raise up a significant force of short-term missionary educators to multiply the number of laborers in God's worldwide harvest."" --Flip Buys, experienced missionary; cross cultural theological educator; International Director, World Reformed Fellowship Steve Curtis, DMin, PhD(c), is the International Director of Timothy Two Project, International. He has taught pastors in multiple countries throughout Asia and Africa and published a number of books and articles on theology and missiology. He presently lives in Potchefstroom, South Africa, with his wife, Rissa, and their sons, Judson and Timothy. 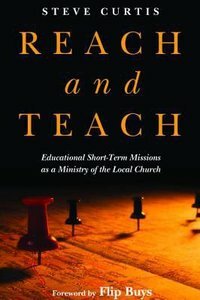 About "Reach and Teach: Educational Short-Term Missions as a Ministry of the Local Church"